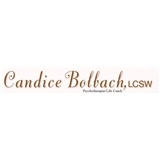 Candice Bolbach (New York) - Book Appointment Online! In the blink of an eye the future is here. It is in that moment we have the power to choose to change our lives. If you are here you are probably searching for help, support, advice or direction. When a person reaches this point where life issues overshadow their ability to find happiness and self-fulfillment, they often find themselves stuck, and not knowing how to get unstuck. It is at this point many of my clients seek my help. I believe that anything is possible and together we will find an opening to create the future. I believe that therapy is a collaborative effort and can provide the vehicle of enlightenment and motivation that can transform and inspire you to dare to dream and visualize your future and create an imperishable plan of action that will lead to full actualization and make a permanent change in your life that is predictable and repeatable. Very intelligent and motivated person, she is willing to help and it's immediately apparent.